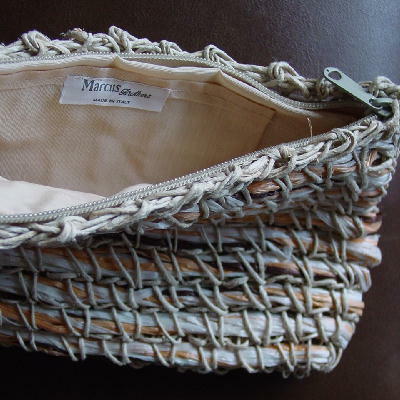 This straw woven purse has horizontal pieces of twine from top to bottom and all the way around. It has a top side to side zipper, a champagne-bone color fabric lining, and an open pocket with a tag that says "Marcus Brothers made in Italy". There is a 19 1/2" long twine woven wrist strap. 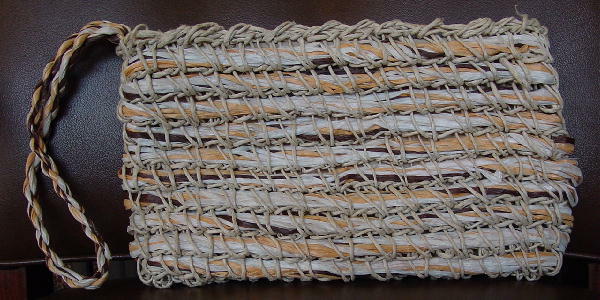 The woven straw is in a bone color and the twine is in white, apricot, and chocolate brown. She got it as a birthday gift from her exboyfriend.